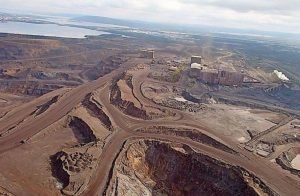 LABRADOR – Tacora Resources, based in Grand Rapids, Minn., has secured the needed cash to restart the Scully iron ore mine at Wabush. Funds are available from a US$212 million private equity and senior secured debt financing as well as up to US$64 million in mining equipment and debt financing. Tacora acquired the Scully mine in July 2017 and conducted a feasibility study for the mine’s reopening. The results were positive, and the company has been busy. It has a labour contract with the United Steelworkers, life of mine access to rail transport from the mine to Pointe-Noire, Que., and ship loading infrastructure. Tacora has also secured a long term offtake agreement with Cargill Metals. The mine is expected to be back in operation next summer. A workforce of 260 will be needed to produce 6 million tonnes of iron ore per year. A long list of employment and business opportunities at the Scully mine can be found at www.TacoraResources.com.